Last months there was a debate about the sponsoring of Jihadist/terrorists, by the Dutch government. 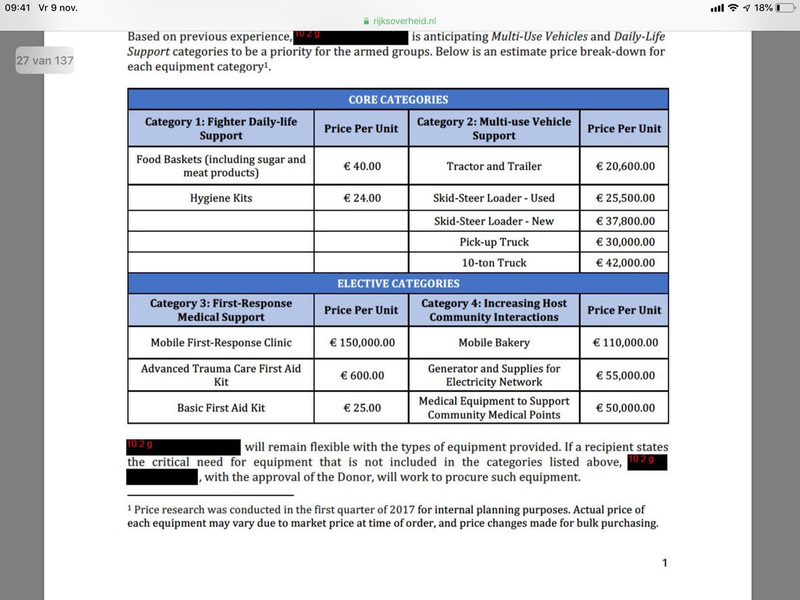 I wrote about it in two articles, today is the continuation, released documents by the Dutch government, which is actually a big dissapointment, the released documents, as expected, are not readable, the most important passages are marked black! But let’s make a reconstruction of the facts starting in 2017 up to 2018 and then to figure out who where among the groups (the Dutch government says 22) sponsored by the Dutch government and taxpayers of the Netherlands. Note: From 2012 up to 2015 it’s very clear they supported the so-called FSA (Free Syrian Army), who were established and made by the US and her allies, among them the Netherlands. But in 2015, things started to get really bad, when the US unleashed ISIS (made in Camp Bucca, like Abu-Bakr-al-Bagdadi, a.k.a Shimon Elliot). 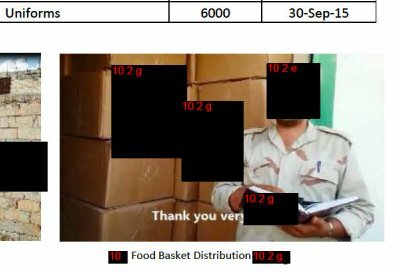 By then the Dutch government should have drawn a red line, knowing that they sponsor terrorists, but they continued doing so up to October 2018. In the debate, as I mentioned in one of my articles: The regular (Dutch) MSM highlights only one group, which is a rather not significant group Jabhat al-Shamiya https://en.wikipedia.org/wiki/Levant_Front, who was resolved, in 2015, after the SAA won the battle of Aleppo, but of course they went on as Ahrar-as-Sham and now Tahrir-as-Sham, being part of ISIS. Also, the Kurdish representative of the Socialist Party brought up, consequently, the https://en.wikipedia.org/wiki/Sultan_Murad_Division, who conducted warcrimes in eastern-Aleppo in revenge on the Kurds in the Sheikh Maqsoud neighborhood, inhabted mainly by Kurds. So, here we have two groups who were supported and financed by the Dutch government, the Levant Front, who was resolved in 2015, but up to now known as Ahrar-Tahrir-as-Sham, ISIS (still highly present in the IDLIB region) among these fighters in IDLIB are many Jihadist from European countries, like the Netherlands. The second group being the Murad Division, part of Fatah Halab. Here we discover more groups, who must have been sponsored by the Dutch government, because, the plain facts they were part of Fatah Halab, like the Murad Division. Affiliation: none. Area of operations: mainly Idlib, Aleppo; also Hama. Ideology: Sunni Islamism. Formed in March 2014, mainly by fighters formerly part of the Muslim Brotherhood‘s Shields of the Revolution Council. The fighters wanted to distance themselves from the Brotherhood, which is viewed negatively by many Islamist and non-Islamist rebels alike. At the same time, the Sham Legion held a similar ideology and has been considered close to the Brotherhood. The group was originally framed as a more moderate alternative to the Islamic Front. Since then, though, its position on the Islamist spectrum has become more ambiguous. The Sham Legion was one of the seven founding members of the Idlib-based hardline Islamist alliance Jaysh al-Fatah, which was dominated by Ahrar ash-Sham and al-Nusra. It left Jaysh al-Fatah in January 2016 amid tensions with Jund al-Aqsa, which spent much of 2015 and 2016 dithering about whether Jaysh al-Fatah was sufficiently devoted to the implementation of Sharia law. Somewhere, around this time, the Sham Legion began deploying TOW missiles; the supply evidently continued even after the Sham Legion rejoined Jaysh al-Fatah in May 2016. When widespread clashes between the newly-formed HTS on one side and Ahrar ash-Sham and several FSA groups on the other in January 2017, the Sham Legion initially stated its wish to remain neutral, but it ended up siding with Ahrar after being attacked by HTS forces. This incident demonstrated the Sham Legions’ relatively decentralized structure; while some parts of it are closely allied with Turkish-backed FSA groups, other parts have tried to maintain links with jihadis hostile to Turkey and the FSA. In February the group absorbed fighters from Harakat Nour al-Din al-Zenki (which had helped to form HTS) who wished to continue participating in the Turkish-led Hawar Kilis Operations Room. Other rebels later accused many of those fighters of being thugs and spies for HTS, and the Sham Legion ended up disowning them. In March the fighters from Ajnad al-Sham Islamic Union who had been relocated from Darayya and Muadamiyat joined the Sham Legion. The famous TOW gunner Suhail Muhammad Hamoud, better known as “Abu TOW”, is currently a member of the Sham Legion. He had earlier been part of the Hazzm Movement (see defunct section), 101st Infantry Division/21st Combined Force, 13th Division, and 1st Coastal Division. Abu TOW has been noted not only for his accuracy but for his anti-jihadi attitude. After several failed attempts on his life, he was arrested by HTS in May 2017 after posing with a cigarette in front of an HTS no-smoking sign. The subsequent public outcry and pressure from fellow rebel groups forced HTS to release him after two weeks. These above mentioned group(s), are all part of the Levant Front and therefore, can be considered to be sponsored by the Dutch Government. Affiliation: Free Syrian Army. Area of operations: Aleppo. Ideology: moderate Sunni Islamism, Turkish nationalism; “neo-Ottomanism”. Founded in March 2013 as the Sultan Murad Brigade. The most prominent affiliate of the loosely-organized Syrian Turkmen Brigades and the closest rebel group to the Turkish government. It was vetted for TOWs in mid-to-late 2014. In December 2015 the brigade absorbed a number of smaller Turkmen groups and adopted its present name. Due to its closeness with Turkey, the Sultan Murad Division has been among the rebel groups most adamantly opposed to the Kurdish-led SDF. The group has been accused of a number of human rights abuses over the years, including torturing and murdering civilians and POWs and participating in the indiscriminate shelling of civilian areas in the Kurdish neighboorhod of Sheikh Maqsood. 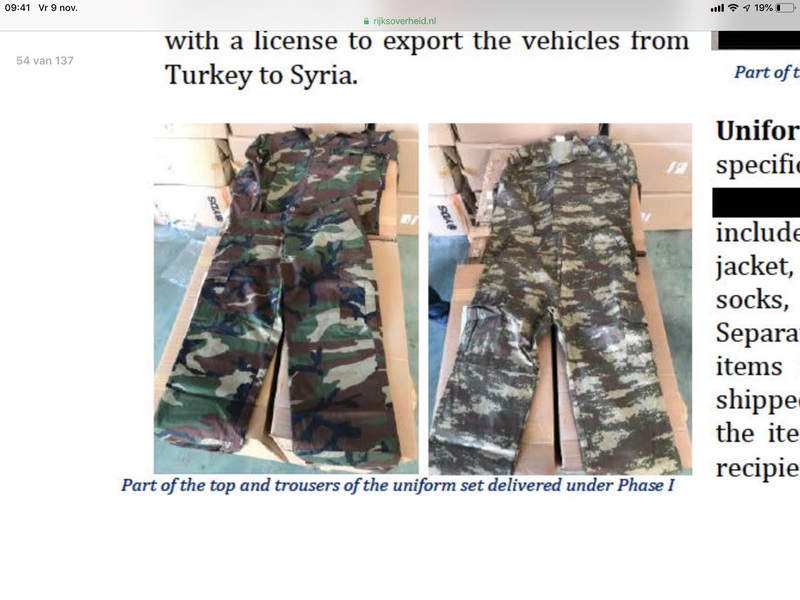 The question is were they sponsored by the Dutch government, because it's a Turkish founded group, but Turkey was an ally and part of the "Friends of Syria" group, so most likely yes! Affiliation: Free Syrian Army. Area of operations: Aleppo. Ideology: Sunni Islamism. The Levant Front is the direct descendant of Liwa al-Tawhid, one of the major rebel groups in the war from its founding in July 2012. Liwa al-Tawhid positioned itself in between the moderate Islamists in the FSA and the hardline Salafis like Ahrar ash-Sham, and as such enjoyed good relations with most other rebel factions. 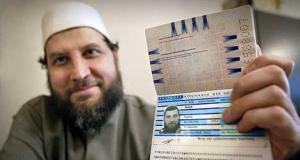 It was a member of the Syrian Islamic Liberation Front and later helped form the Islamic Front in November 2013. Just days previously, however, its popular leader Abdul Qader Saleh was killed in a government airstrike. Over the course of 2014 the brigade declined steadily, experiencing many defections. What was left of the group helped form the Levant Front operations room, which united the Islamic Front’s Aleppo forces (mainly Liwa al-Tawhid, with a small contingent of Ahrar ash-Sham) and four other Islamist groups in the governorate. The operations room fell apart in April 2015, but it reformed as a unified group in June. At this point the Levant Front was essentially a rebranded Liwa al-Tawhid. In 2016 the group adopted the FSA identity and began deploying TOW missiles. It has been accused of war crimes, torture, and corruption at various times. This group was heavily sponsored by the Dutch government and I presume many of the goods, weapons and medical equipment were sent to them, also the famous Pick-up Trucks! So-called evidence of the Dutch government, the most important passages are censured! The al-Tawhid Brigade, named after Tawhid, the “oneness of God,” but often mistranslated as Unity Brigade, was an armed Islamist insurgent group involved in the Syrian Conflict. The al-Tawhid Brigade was formed in 2012. Reportedly backed by Qatar, al-Tawhid was considered one of the biggest groups in northern Syria, dominating much of the insurgency around Aleppo. 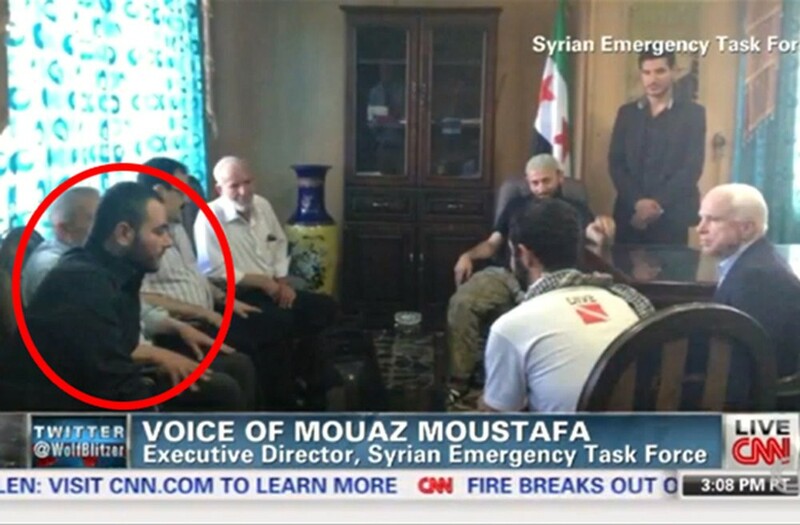 Affiliated with the Muslim Brotherhood, in late 2013 it co-signed a joint statement calling for Sharia law and rejecting the authority of the Syrian National Coalition. Originally, al-Tawhid was composed of four subunits, the Mountain Knights Brigade, the Darat Izza Brigade, the Free North Brigade, and the Aleppo Shahba Battalions. Red: 5 more groups indirectly sponsored by the Dutch government. It’s leader Abdul Qader Saleh was killed in November 2013 in a Syrian Air Force airstrike. Its northern branch, the Free North Brigade, was in 2014 reportedly “superseded” by the Northern Sun Battalion (Shams al-Shamal). Red: two more groups indirectly sponsored by the Dutch government. Many things are written about the White Helmets and the conclusion of many journalist and sources is that the White Helmets are part of Al-Queda. The worse part of it is that their Organization’s headoffice is situated in Amsterdam, paid by the Dutch government. Wat is er gebeurd met de Witte Helmen? De volgende doofpot affaire! For a lot of people it might be confusing all these groups, but one must bear in mind, that all these groups mentioned above, are, as many Syrians say, called different names, but their ideology is the same, based on Muslim Brotherhood and Wahabi principles. And later all part of Al-Queda or affiliated with ISIS or IS. The Muslim Brotherhood, is present since decades in the Middle-east and banned in secular countries like Syria, also Tunesia, Algeria and Egypt had brief encounters with groups affliated with the Muslim Brotherhood, before that Jemen and Iraq. Many of it’s so-called members were granted asylum in Europe, the first batch in the late nineties of the last century, due to the unrest in Algeria and Tunesia. The most prominent Jihadi/Salafist/Wahabist sheik in the Netherlands is Fawaz Jneid: Fawaz Jneid was born in Lebanon but was given Syrian nationality after his birth. He worked as an imam in Saudi Arabia and the United Arab Emirates. After the Gulf War he got problems there because, of his so-called anti-American attitude and left for the Netherlands in 1992, were he was granted asylum, double standards of course, anti-American and asylum in the Netherlands. Fawaz speaks poorly Dutch, but can be assisted by an interpreter in public. He is still living freely in the Netherlands and calls for Jihad in Syria! Many mosques are sponsored by the KSA and preach the Wahabist ideology, already many many years in Europe and under the knowledge of the Dutch Government, they were preaching Jihad for Syria and many members of these mosques went to Syria for Jihad, fighting for Al-Queda, ISIS or above mentiond groups, who later emerged with ISIS. Picture: Fawaz Jneid FOK news. Also, prominent members from Hama, (the failed coup from the Muslim Brotherhood in Hama) went to Europe for asylum and now they have many bases in Europe, after the making of Al-Queda, by the US, the Muslim Brotherhood emerged with Al-Queda and got all other names during the imperialisic wars from the US/NATO in Libya, Syria, Iraq, Afghanistan and indirectly Jemen. They are, so to say, the mercenaries of the US/NATO. Saudi Arabia is the main sponsor of many groups in Syria, in co-operation with Turkey and Qatar (who withdrew and was severly punished by the US and KSA). The KSA is having ties with the racist regime of Israel, who has its own aspiration of a greater Israel and the destruction of all Palestinians, of course, in a “psychological Democratic” way, they will try to discourage the Palestinians to live in the West-Bank or Gaza (Gaza is a totally different story – meaning Hamas, Hamas is created by Israel). Because, of their “psychological – punishment of the Palestinians”, many Palestians are radicalized and therefore, have their own reasons for Jihad. The Dutch government must have had the knowledge since the making of the conflict in 2011, which they called the “Arab Spring”, meaning the destruction of the Middle-east and eventually bring it under control of NATO/US and Israel. As from 2012 it was clear that the groups (so-called 22) they supported were not “secular – democratic” opposition, but mainly Jihadist groups, who were formed with the help of the US, KSA, Qatar, Turkey and EU countries like the Netherlands. The repression and unrest came from the Jihadist, who were undoubtly present in the country, as I recall the neighborhood called “Harasta” was a safe-heaven for many Muslim Brotherhood activist, also Hama, were the Muslim Brotherhood attempted their coup in 1982. In the ninenties of the last century, they were called Al-Queda, made by the US (or sponsored) and fought in Afghanistan. After that they “used” them in Libya, then transferred them to Syria (mercenaries of the west). Many ex-military serviceman of Iraq, after the murder of Sadam Hussein, were detained at “camp-Bucca”, they received training from the CIA/MOSSAD to become ISIS, unleashed in 2015, within 24 hours they conquered parts of Iraq and Syria, with help of the US/NATO. When they conquered villages and towns, the above mentioned groups and not mentioned groups emerged with ISIS, because, there was no other choice to do so. The Dutch government has to my opinion, after doing seven years of research and seeing many evidence, visited Syria frequently, sponsored terrorist and is guilty of crimes against humanity in Syria. Vorige Vorig bericht: Khasoggi, de Wahabistaat Saoedi Arabië en de “Axis of Evil” ! Volgende Volgend bericht: Assad killed his own people, debunked in Homs!